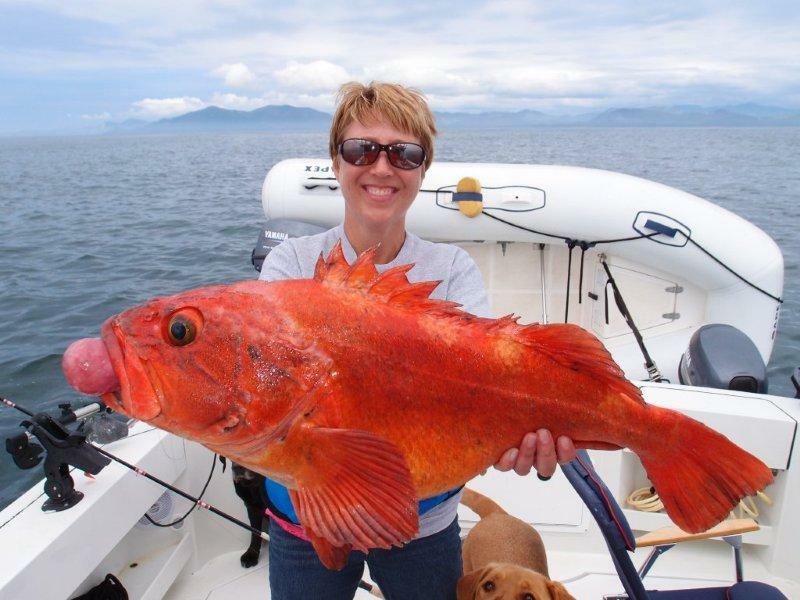 33' to Alaska: Day 7- Sunday, Aug.19 - Sea Otter Cove to Browning Inlet by Winter Harbor - Great Fishing! 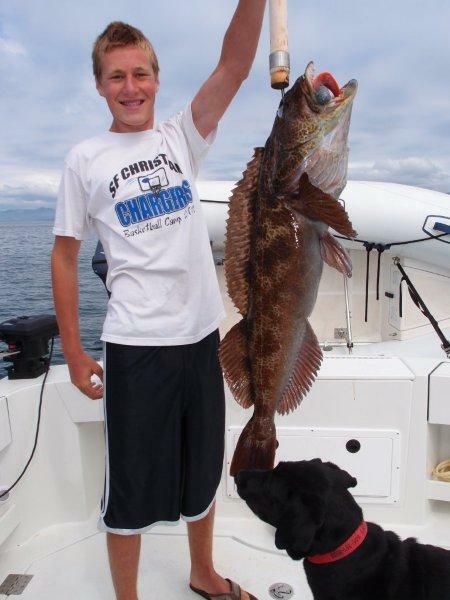 Day 7- Sunday, Aug.19 - Sea Otter Cove to Browning Inlet by Winter Harbor - Great Fishing! 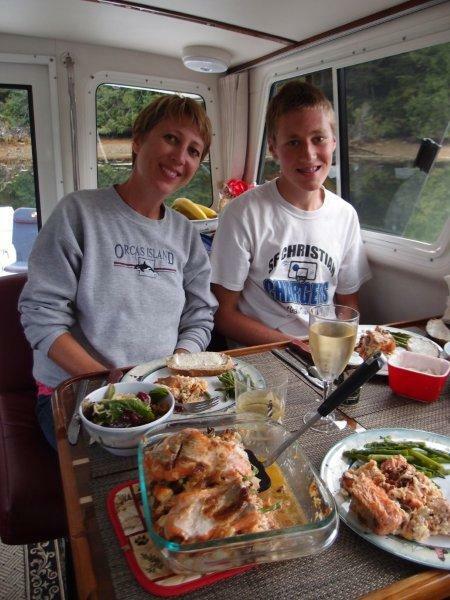 Day 7 – Sunday, August 19, 2012 - Sea Otter Cove to Browning Inlet (By Winter Harbour, Quantsino Sound) – Great Fishing! What a great day it has been. We got an early start this morning and were motoring out of Sea Otter Cove by 7:30. 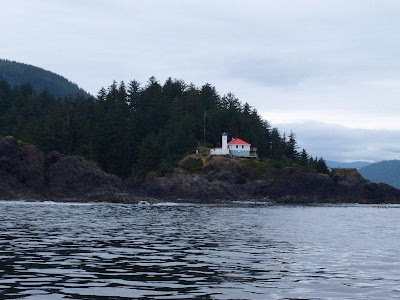 Our prayer was for flat seas and visibility to make the 20 mile run on the outside unprotected waters to Quantsino Sound. It was overcast but no fog. As the engines warmed, we cruised into San Josef Bay to check out the beach. It was probably the nicest one yet but we wanted to keep going. The water was flat calm! Praise, God! Seriously, we did, too! This is a great place to have church! As we got closer to our destination, I thought I saw several boats offshore, a rarity so far. I turned on my radar and, sure enough, about 4 miles out, I picked them up on my screen. I said to Val that my guess is they are fishing boats out of Winter Harbor and I asked her if she wanted to fish. She can never say no. She loves fishing more than anyone I know. 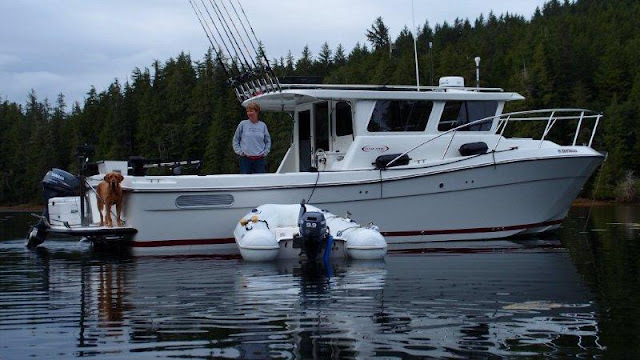 We turned in the their direction and saw all kinds of guide boats out there pulling in salmon with their clients. 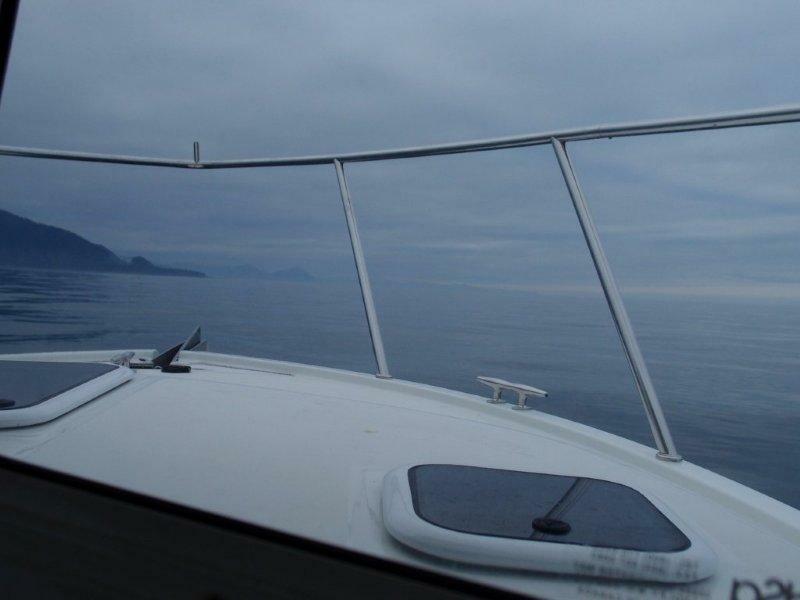 With flat seas and brightening skies we geared up for the big catch planning on spending a short time giving it a try. Within minutes, Val and I were pulling in cohos. Connor, sound asleep in his berth, heard the excitement and decided he wanted to try too. We all had great success. We could have limited out in cohos but we’re only allowed a total of 8 salmon a piece on this trip (possession limit) and want to save them for some big king salmon, hopefully. 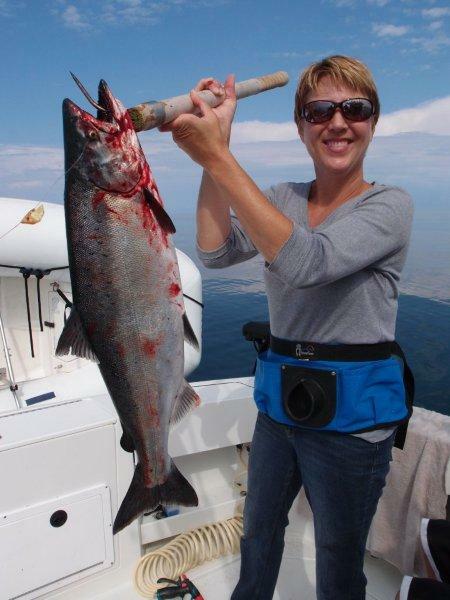 So, we kept a real nice coho that Val caught for eating, even though we still have a package left from Beaver Bay. I pulled in two real nice Ling Cod, a real treat. We slowed our troll down hoping to tempt a halibut into biting and, sure enough, I pulled up a small “chicken” but at least there’s fresh halibut in the fridge and a few packages in the freezer. Val sounded like she was in labor but finally landed the biggest Rock Fish, a.k.a. Red Snapper, I’ve ever personally seen. What a prehistoric and crazy looking fish. They grow really slow and it’s sad that a fish like this may be 100 years old. 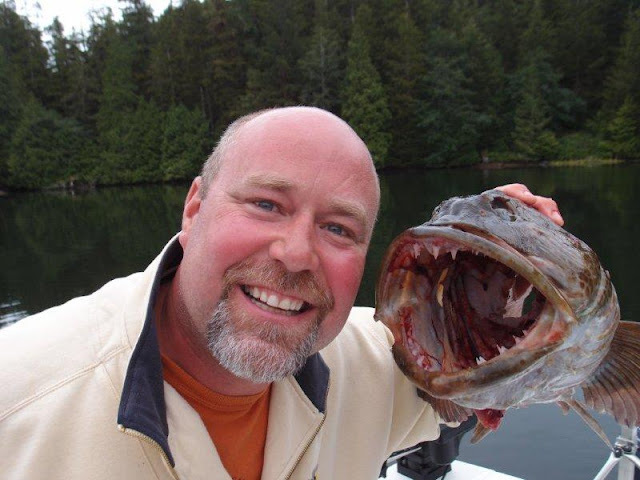 The DFO does a nice job of limiting catches but it’s not always easy to know where and when you can catch them. This one was a real beauty. Connor was complaining because his pole wasn’t as hot as Val’s. He said he needed a “herring aid.” We all thought that was pretty clever and got a chuckle. Sure enough, it was Connor’s turn for a big one. 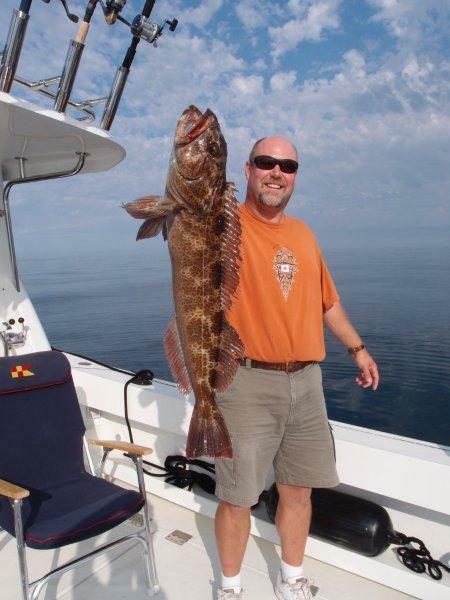 He fought long and hard and pulled in the biggest Ling Cod I’ve ever seen (besides in pictures.) This fish is even more prehistoric looking! They have huge heads and huge teeth but skinny bodies, although this guy yielded nine packages of nice filets which make the best fish and chips (at least the fish part of that dish.) It was non-stop action but I knew there was a lot of fish cleaning and boat cleaning to do so I had to pry the fishing poles out of the hands of Val and Connor and we headed towards the inlet. The weather turned out to be such a blessing even though we could hear thunder and see lightning in the distance. I kept a vigilant eye on the system and meanwhile enjoyed the warm sun and glassy seas. We rounded the corner into Quantsino Inlet and found a pretty little cove to anchor in. Connor started his homework while I cleaned fish and Val vacuum packaged them. We carry a deep freeze in one of the fish holds and keep it cranked as cold as it will go. Then, we run the inverter when the engines are running or the genset when we’re at anchor but, much of the time, we’re able to keep things frozen solid even when the engines and the genset aren’t running just by letting it “coast” a while. Val started dinner and I went for a kayak ride while Connor continued his studies. An hour later, Val had one of my favorite, most amazing meals ready: salmon filets stuffed with bacon, asparagus, and tons of crab, covered with mayo and a perfect blend of monterey jack and parmesan cheese with a side of fresh asparagus, a salad, and my made from scratch tomato basil baked bread, fresh from the oven and still warm. Oh my, what a meal! Well, tomorrow is Monday and it’s back to the office. Our plans are always pretty loose on the boat as there are many, many variables to change everything. 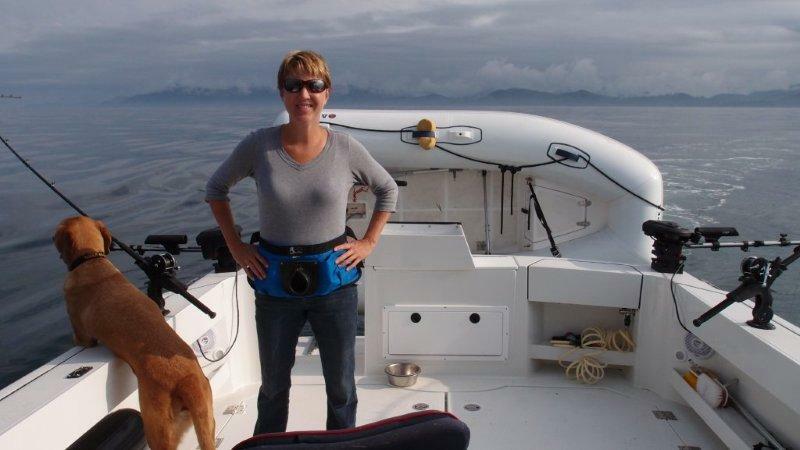 I plan to get up early and take the dinghy into Winter Harbor (about 3 miles) to try to find a phone connection and Internet. Connor will start school. Val will clean the boat and prepare the laundry. 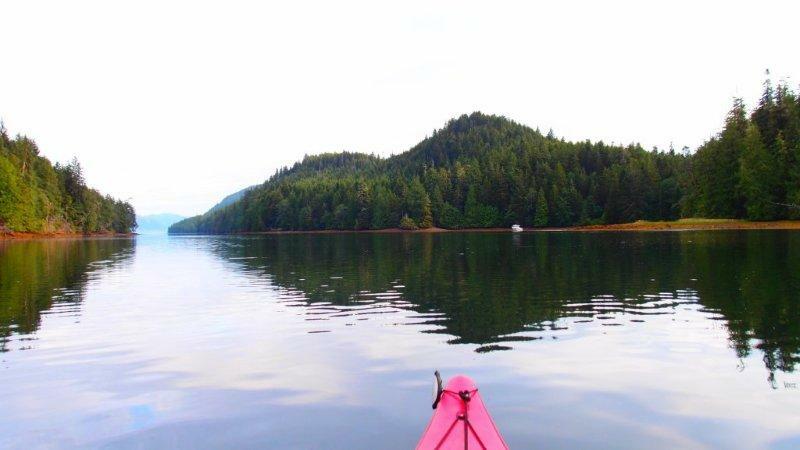 Upon my return, we hope to go for a hike and then afterwards, we’ll take the Dakota Roamer (the mother ship) into Winter Harbour to do laundry and fill her with water as well as more communications with the outside world. I haven’t had a cell signal since Thursday night. I’m not complaining but I don’t want anyone waiting on me or worrying about us. The boat is running great. Ron Meng and IMC crew have done a great job with their Ocean Sport Roamers. This boat works perfectly for our family and is very comfortable for the way we use it. I am very thankful for the places she takes us and the things we experience. What a great way to be a family and live a grand adventure. Well, that’s it for today. I hope you are all doing well. Send me an e-mail sometime. Blessings, friends.